A Buddha-ism – Learning to walk and think more slowly – Not easy I warn you! 3:00 am comes really quickly, even if you are sleeping on the floor. And by 3:18 both the Intrepid traveller and I were up and listening to the 4 gongs being rung to wake all sentient beings. Not sure about everyone else – but I was awake – trust me. We then walked – two columns, extremely slowly – into the prayer hall and following our leader, respected Buddha (that’s 3 full bows), respected the past, the present and the future (waist bows to the East, the North, and the West), and prayed with the Monks. None of them looked very sleepy – but I can’t say the same for our team. We then walked – again in 2 columns, again very slowly – back to the 2nd prayer room – to do our 108 bows to Buddha. Why 108? It’s an important number to Buddhists – as our Monk explained, because there are 6 senses (the normal 5 plus time), there are 6 feelings (like, enjoy, etc.) and 6 * 6 is 36. And there is the Past, the Current, and the future – and 3 * 36 = 108. So 108 bows. These are not at the waist bows – these are done starting from a standing position, dropping to a kneeling position, putting your head against the mat, raising palms to the level of your ears, pushing forward on to your knees, and finally standing again. Try it. Not easy. Now do 108 of those while the Monk claps a stick to keep time. One of our group was in charge of a rope of prayer beads – she moved one with each bow to keep track. I had decided the night before that if I could do 54 (1/2 the required number) – I’d be impressed. But surprisingly – I did all 108. Later on one of the group commented that its very hard to do 108 bows alone – but in a group, it’s easier. You gain mental and physical energy from the group. I think he might be on to something there – surely a 65-year-old – not in the best shape – old lady doing 108 bows is pretty incredible. I was impressed with me I’ll tell you. And now it’s time to do the really hard thing – the sitting mediation. 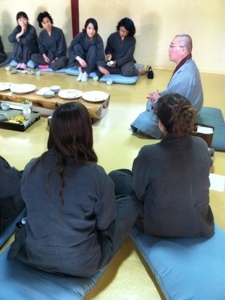 Our Monk had told us that the Monks actually do 7 days of mediation – no sleeping. They eat, they pray and they meditate – And if they come 20 minutes late to any of the mediation sessions – they are banished from Haein-sa for 3 years. 3 Years! But I’m still worried. First off – no talking. Ok – I can survive an hour of no talking. 2nd – no fidgeting – no scratching your nose, no moving your knees, no moving your hands. That doesn’t sound much like me. And third – you have to keep your legs bent in the lotus position the entire time. This is going to be tough. He did give us some hints. One – concentrate on your breathing – one breathe at a time. Think about who knows you are breathing. And when something begins to bother you – think about it not hurting you. And when stray thoughts come into your mind – think about them, and then go back to thinking about your breathing. My favorite hint – keep both knees touching the mat. And fold the mat double. I asked during our ‘Tea’ what was wrong with thinking – and was told – it’s not thinking that the problem – it’s flighty thinking – this and that and that and this – no pattern, no control. Try to control how you think. Ouch – that’s a huge challenge. I can’t even control my thinking when I’m typing… Even when I’m writing my blog I’m also listening to the people talking in Korean on the floor below me, and hearing the sounds of the birds and the traffic. But I’m willing to give this a chance. So we go into the meditation hall, I struggle into the lotus position and shut my eyes. All is going ok when I hear the first ‘Crack’. The Monk has struck one of our group for falling asleep. Well nothing wakes you up faster than that I’ll tell you. The struck individual, as instructed, thanks the Monk for reminding him to mediate, not sleep, and we all go back to meditating. Twice more there are ‘Crack’s’ – but not once was it me. And then just as quickly as it began – it is over. An hour passed so fast – I couldn’t believe it. Next on the schedule is lying down mediation – and they tell us we can sleep. I think I slept – Jill says so anyway. Next is breakfast (lots worse than dinner – and dinner was pretty bad) – then its time to do our share of work. In our case its pretty easy – clean up our living quarters. I was hoping we’d help with farming – but no such luck. Guess they didn’t need inexpert farmers today. 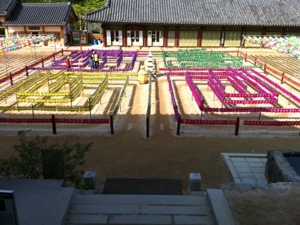 We then get an escorted tour of the grounds of Haein-sa – which includes a walk around the comtemplation maze – again slowly – and in Hapjong position. Eventually we re-group with our Monk to discuss our Temple Stay. When we first met – we introduced our selves – our names, and countries of origin. This time the Monk challenges us to introduce ourselves – but without using our names, our jobs, our countries. To in fact – introduce ourselves by saying something important and unique about us. Not surprisingly – we learn a lot more about our fellows this time – information I’ll remember long after I’ve forgotten their names. Examples: “I lack judgement”, “My best friends are my sister and brother”, “I don’t like myself very much”, “I talk more than I listen”, etc., etc. Some in our group use this opportunity to explain what was most surprising to them – and beside the Noble Silence – many comment on how hard it was to walk slowly. The general feeling is that we live life to fast to enjoy it – that taking time to slow down and just think – meditate – isn’t as wasteful as it first seems. Most of us agree to try to think a bit more slowly in the future. At the end, our Monk encourages us to consider the current as most important – the past shaped us – brought us to where we are today – but can not change and has no power over us. The future is driven by the current – so knowing where you are today is key to your future. He gives us some gifts, a booklet about Buddhism, and a wooden bead bracelet with Chinese lettering. He explains to me that the bracelet says – “Your dreams and wishes can come true”. I wear it with pride. The intrepid traveller and I leave Haein-sa – glad we came. I have a great idea – let’s go stay in a Temple – Vegan meals, you sleep on the floor, you get woken up at 3:00 am by drums to pray with the Monks, there’s 108 bows (from standing to full prostration) to Buddha to perform, followed by an hour of no fidgeting, no moving, meditation. Doesn’t that sound like fun? You really have to wonder what I’m thinking some days! Fortunately, the Intrepid Traveler is a good sport – and willing to take a chance on these insane ideas of mine. So among our other plans for South Korea – we included a 2 day and 1 night stay at one of South Korea’s most famous monasteries – Haein-sa. A couple of things you should know – the difference between a ‘Temple’ and a ‘Monastery’ is not what you might think. A ‘Temple’ is just a place of worship, a ‘Monastery’ contains not only a ‘Temple’, but also a school for Monks and a meditation center. 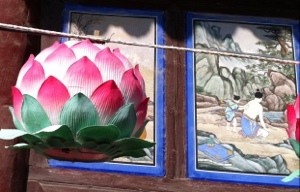 Haein-sa has all that and more – it is also home to the Tripitaka Koreana – the oldest set of wooden printing blocks of the entire writings of Buddha in the world. 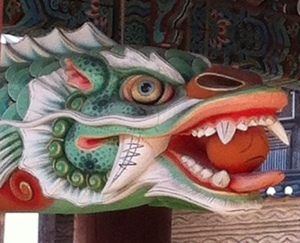 This makes Haein-sa a double UNESCO world heritage site. It was saved from bombing during the Korean War because the US asked Korean fighter pilots to bomb it – and they recognized the value of the site – and dropped their bombs on the other side of the mountain. Bottom line – it’s famous. It’s also hard to get to. I guess that figures. 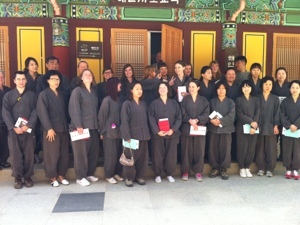 So Jill and I get on an express bus out of Gyeongju for Daegu, switch to a local bus in Daegu for Haein-sa – and find ourselves packed in tight with fellow worshipers heading up the winding mountain road. The drive alone is a religious experience – of the ‘Oh Man – missed that one – Yikes – missed that one’ variety. Narrow roads, steep inclines, and buses passing buses for most of the 2 hour trip. Eventually we arrive at the ‘Lion’s Gate’ – the official entrance to the site. The bus continues up past 2 different parking areas, eventually dropping us at the ‘end of the line’ – and the beginning of a 1 km hike up to the main temple. Haein-sa looks like I think a Buddhist temple should look. It’s isolated, it’s green, there are winding mediation paths everywhere, and there’s a wonderful mountain stream running over giant rocks to our left. It’s stunning. And crowded. And steep. And while we could stuff Jill’s suitcase into a locker at Daegu, mine didn’t fit – so she’s got her overnight stuff in a backpack – I’ve got mine in my backpack – and I’m dragging my suitcase. Not going to be fun. Thank goodness for the kindness of strangers. On the bus a lovely young lady on her way to the Temple to pray had been telling us where we should get off – and when she realized that we had this suitcase to drag up hill – for a very long km – she pushed me aside and grabbed the handle. Jill made it about 1/3 of the way before I took her backpack off and added it to the suitcase – harder on our young friend but a lot easier on Jill. We walk slowly up to the main entrance to the Monastery – and then up 108 steps to the temple grounds. Our friend finds the Temple Stay office for us – and wishes us health on the rest of our trip. We wish her success with her prayers. At the Temple Stay office, our charming hostess checked us in, gave us our temple uniform, and escorted to our cozy room for 15. We collapse. It’s cool, and we’re wiped – and there’s a long night ahead. During our stay – we must follow the temple time-table – and we must wear our temple uniform of baggy grey pants and an over wrap. The good news – everyone looks a bit funny, and no one sticks out. Plus we are clearly identified as Temple Stay participants – which gives us access to Temple dining, and a front row seat (well – kneel really) at services at 3:00 am. Our fellow participants are a mixed group – about 40% are Korean – the other 60% have English as the common language, Australian, Brits, Americans and surprisingly at least 6 Canadians. The biggest single group is a cluster of English Teachers in private schools here in Korea – mostly pre-k, kindergarten, and up to 2nd grade. They share a website so they can meet up with each other to avoid feelings of isolation. And they decided that a Temple Stay would be a good cultural experience..
First up – Temple manners. We remove our shoes to enter the practice hall – and the Monk chosen to lead our group takes us to task for being sloppy and disorganized. Do it again – and get it right this time. Who knew that taking off shoes had rules? Shoes removed to his satisfaction, we now must learn to bow. Silly me – thought I knew that. Nope. Turns out you must do this a special way as well. It’s feet close together (that makes it harder according to our teacher), knees to the prayer mat, hands to the mat, head touching right above your eyes, hands up and cupped – held level with your ears like you are lifting Buddha to heaven, hands down, then push forward, then push back and up to standing. Repeat. and Repeat. 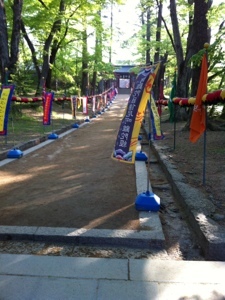 The third of the set includes a hapjang (palms together, fingers pointed towards your eyes). Then we learn the proper position for mediation. There is standing mediation, walking meditation, and sitting mediation. Our teacher focuses on walking and sitting. Learning to sit isn’t that easy either. You have to have both knees touching the ground while one foot supports you and the other is folded on top. And your back must be straight. We will be doing an hour of this – and if we fall asleep – we will be struck with a stick – which the assistant demonstrates on the Monk. Ouch. 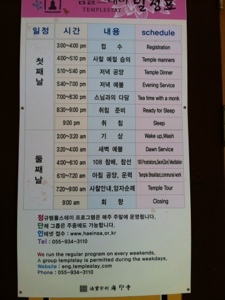 By the way – our Monk doesn’t speak English – so he speaks Korean and our hostess translates. But watching him move is intriguing, he is so graceful and elegant and efficient. No wasted gestures. Quite beautiful in fact. It is now time for temple dinner. We’ve been warned to be silent during dinner – in fact our Monk has challenged us not to make idle chatter while we are at the Temple, and also been told not to make any comments about the food. We must be grateful to be fed. Well – I was grateful, but also glad that Jill and I had smuggled in some pastries from Paris Baguette. Monks don’t eat well. Even for Vegans. After dinner, it’s time to put our temple manners to the test. We line up in 2 columns (Koreans do everything in 2 columns – just saying) and walk slowly with our hands clasped in front of us to the drum pagoda. There are 5 different kinds of instruments, a large (twice the size of a man) drum, a wooden fish drum (see pictures), a cloud shaped gong, and a huge bell. All will be played by the Monks before prayers are started. After listening to them, we proceed up 4 flights of stairs – no banisters, very steep – to the main temple, and take our prayer mats and places to the right front. There are already a fair number of participants – all further to the back than us. The Monks (about 8) silently join us – and the lead Monk starts the service by striking a wooden gourd. We bow in time with the others – hum along with the sung prayer, bow a few more times in unison, and then are excused. It is now time for what I think is the highlight of the day – something called ‘Tea with a Monk’. There are about 32 of us in total – and we gather in a circle – and are invited to ask our Monk any questions we want. Some are pretty banal – the number of Monks in the temple (it varies – from a dozen to 200 when there is a full retreat), why our Monk became a Monk (He prayed for guidance for 2 years before making the choice), but some are really important. One gal asks what we should be thinking about when we meditate – and that leads to a long discussion about meditation in general. Our Monk suggests that we focus on our breathing – and ask ourselves – who knows that we are breathing? Another gal confesses that she doesn’t think she is worth much – and the Monk takes her to task – You must rid yourself of these thoughts, you must accept who you are – your past made you this way – it is the current and the future that you can change. 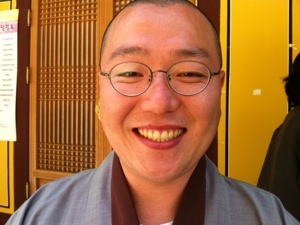 In general, the Korean participants ask the more meaningful questions, but the Monk rephrase them to be applicable to all. I keep thinking of the Jewish Mantra – “This too Shall Pass”. At the end of what becomes a very emotional and for some ‘weepy’ session, we are excused to go to bed. End of a long, but oh so interesting day. Signing off in silence – The soup lady and the intrepid Traveler.